In part 13 of this analysis, we observed that David Bowman suffers a subdural hematoma, which is a type of traumatic brain injury, when he is 'ejected' into the emergency airlock of Discovery One and hits his head on the airlock wall. 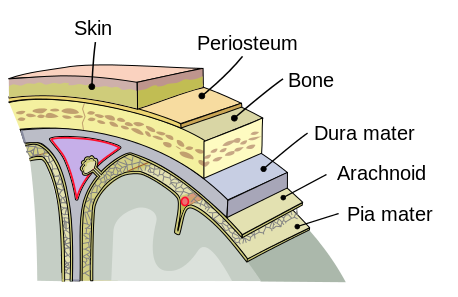 To get a better physical picture of where the internal bleeding from this injury occurs, we refer to the above diagram, which shows the meninges, the system of membranes that envelops the central nervous system including the brain. When a person has suffered a subdural hematoma, blood collects between the dura mater and the arachnoid mater, creating intracranial pressure,[a] and thus causing (in Bowman's case) the symptoms we talked about in part 13. However, there is also evidence that Bowman has suffered a subarachnoid hemorrhage, in which blood collects between the arachnoid mater and the pia mater. The pia mater is a very delicate membrane. It is the meningeal envelope which firmly adheres to the surface of the brain and spinal cord, following the brain's minor contours. The evidence that Bowman has experienced a subarachnoid hemorrhage (in addition to his subdural hemorrhage) is described below. (Note that the terms 'hemorrhage' and 'hematoma' are interchangeable). Top left: Bowman sees this very bright white light while in the stargate. Top right: Bowman's eye is shown while he's viewing this bright light. Note the size of the pupil. Above left: A short while later, Bowman arrives at a point where there is very little light. Above right: Bowman viewing the dark area at left. Note the lack of pupillary light reflex - the pupil of Bowman's eye should have gotten much larger at this point, than it was when he was viewing the bright light; whereas, in fact, it has actually gotten slightly smaller. This lack of pupillary light reflex is one symptom of a subarachnoid hemorrhage. As stated above, a subarachnoid hemorrhage (SAH) is bleeding into the subarachnoid space — the area between the arachnoid membrane and the pia mater surrounding the brain. This may occur spontaneously, usually from a ruptured cerebral aneurysm, or may result from head injury. Up to half of all cases of SAH are fatal and 10–15% of casualties die before reaching a hospital, and those who survive often have neurological or cognitive impairment. [b] As with the subdural hemorrhage, the pressure of the collected blood from the hematoma exerts pressure on the brain. Intraocular hemorrhage (bleeding into the eyeball) may occur in response to the raised pressure. The small round spot just above and to the left of Bowman's pupil (from our perspective), must be due to bleeding into the eye. Michael Mann has inserted hints into some of his movies that Bowman suffers a brain hemorrhage, and an intraocular hemorrhage as well. For example, in Thief, Frank mentions that someone he knew in prison died from a cerebral hematoma. And, in Manhunter and Heat, there is mention of murder victims suffering eight-ball hemorrhages. An eight-ball hemorrhage is a hyphema in which the anterior (i.e., front) chamber of the affected eye is completely filled with blood. Bowman's eye chamber is not completely filled with blood (yet), but the point is that Mann is giving a hint about intraocular bleeding. a. Wikipedia, 'Subdural hematoma'. Web, n.d. URL = https://en.wikipedia.org/wiki/Subdural_hematoma. b. Wikipedia, 'Subarachnoid hemorrhage'. Web, n.d. URL = https://en.wikipedia.org/wiki/Subarachnoid_hemorrhage.